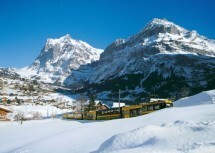 Take a train to Grindelwald and snowshoe the Eiger Trail. We will then walk to the Grindelwald-Männlichen gondola which is our starting point and buy a ticket. I am staying the night before and NYE in Grindelwald, there is still some accommodation around, especially in the few towns prior to Grindelwald if you want to make this an extended trip.